The goal of a security system is to protect the home or property that the system is installed on. A security system accomplishes this goal by securing every entry point to a home. A great advantage of having a security system as opposed to another type of system protect your home is that a security system can also be linked directly to an outside security company or even directly to the police department. This allows for maximum efficiency when responding to a potential threat. A security system operates by sending out a series of alerts that are used to notify these agencies when your security system has been compromised. An entrance alarm can be placed on every single entry point to your home. This could include doors, windows, garage doors, even attic ventilation shafts and cellar doors. The more protected points there are within the home, the more secure your home will be. An entry alarm is generally composed of two metal connectors that are armed when the two connectors are touching. When a window is opened, or a door is opened, the metal connectors separate, the connection is lost, and the entry alarm goes off. This system works very well because it is very low tech, and does not rely on complicated sensors and faulty electronics to detect an intruder. An entry alert system can also be installed on any other area of your property that you wish to have secured. For example, a security system could be set up to protect a pasture fence or the back gate to an estate. All of these entry points need to be secured and an entrance alarm allows you to do just that. The entrance alert will signal when the two connectors on the gate have been disconnected. This entry alert signal could be relayed to a police department, the security center, or even to the property owner’s cell phone. This technology allows for a property owner to always maintain protection over his or her estate and to have complete control over who comes and who goes on their land. An entrance alert system is very effective at managing entry points to a home or property, and is very cost effective to install. An entry alert is the most effective way of catching an intruder before they even reach your property and thwarting any potential criminals from breaking into your home or property. Whether you are single or you have a family security is important. Taking the time to protect the things that are important to you is essential if you hope to have peace of mind. There are several ways to secure your assets, but one of the most effective ways is to invest in a security system. It may not seem like much but studies have shown all things being equal most burglars avoid homes with security systems. And the most obvious first security step is to get an entrance alarm. An entrance alarm makes the homeowner and the security company know when someone has entered the premises without the proper access code. Many of the systems have an entry alarm that sounds when someone opens a door or window without disarming the system. The entry alarm can be a life saver. The noise can startle the intruder and alert the homeowner and nearby neighbors. Many times this entrance alert will be enough to scare off most intruders. A good security company will assess your home and install an entrance alert on all windows and doors that allow entry into the home. Once an entry alert is installed on all the windows and doors a security pad with a code is usually installed either near the door, in the master bedroom or both. The home owner is then given a code which will arm and disarm the system. Some people choose to install security systems that arm themselves automatically at specific preset times. Security systems have improved dramatically in the past few decades. Today their are systems that can be armed and disarmed remotely and can be used in conjunction with security cameras, internal and external lights and automatic on and off switches for radios and televisions. These innovations make it difficult for potential intruders to know exactly when the homeowner is or is not home. You cannot put a price on safety and peace of mind. The cost of installing and monitoring a security system with an entry alert is a small price to pay to ensure your loved ones’ safety. Everyone likes to sleep easy at night knowing that your home is secure. The easiest and most cost effective way to do this is by installing an entry alert system. The basic concept is that an entry alarm is placed at every entrance to your home. Whenever that alarm is activated an entry alert signal sounds in the house. For example, if you place an entry alert on the front door to your house it will chime when someone walks through the door. If it is the middle of the day and your children are coming home from school this is nothing to be alarmed at, but if it is the middle of the night and you hear the chime, you are immediately alerted to a potential security threat. An entrance alarm is the best first line of home defense. The entrance alert signals are loud enough that you will be immediately notified of any sensor that has been activated. You then have the option of contacting the proper authorities if you determine that the entry alarm means there is a potential threat to your safety. Entrance alarms can be used to secure virtually any space. They can be used on large commercial buildings, small to medium sized homes, or even town homes and condo buildings. The entrance alarm system is very easy to install and one of the most cost effective security measures you can buy for your home. You can install an entrance alert system on any conceivable entry way to your home. The alarms can be installed on interior and exterior doors, windows, screens, basements, or even ventilation shafts. 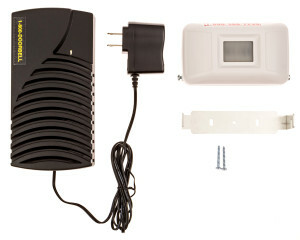 There are also various types of entry alarms. You could buy a motion detector system which detects motion to trigger the alarm or a simple contact alarm which uses two magnetic contacts to detect when an entryway is breached. Once either of these alarms are triggered they send their alert signal to a receiving box which then relays the desired alert. Depending on your security needs alerts can range from a chime, to a buzzer, a strobe light, or even a siren.